As we walked through the back streets of Paphos, my hopes of finding a great spot for dinner were fading. Far from the harbour, where diners sat upon candlelit platforms jutting out into the water, the restaurants appeared brash and tacky, with neon signs and over-eager staff. Eventually, we stopped to look at a menu at Zaza’s Taverna, and were swiftly led inside by the owner. We shrugged. At least someone had taken the decision out of our hands. Zaza’s is tucked away on a quiet street, next to a few other restaurants and some empty looking holiday apartments. As we took a table, a platter of hot, garlicky pitta bread was put before us, and a chilled bottle of Cypriot rosé appeared soon after. Having heard nothing about the wine of the region, I was pleasantly surprised by how beautiful it was. “We have hundreds of vineyards, but we only produce enough for ourselves. Our wines stay in Cyprus” the waiter told us as he took our order. As we gorged on both pitta and wine, our food began to arrive. My moussaka was the perfect introduction to Cypriot dining. Thick layers of aubergine were smothered in creamy béchamel sauce, with gently spiced lamb in between. Zaza’s specialise in suckling pig, which melted in the mouth, as did the lamb stifado. In the middle of the table, a cornucopia of vegetables appeared, with tiny chunks of potato fried with rosemary, shredded cabbage with plenty of bite and minted peas. We ate leisurely, abstaining from dessert when our buttons began to strain. The table behind us ordered Crêpes Suzette, which were cooked in front of us all, amber flames flying high and filling the air with wafts of Cointreau. 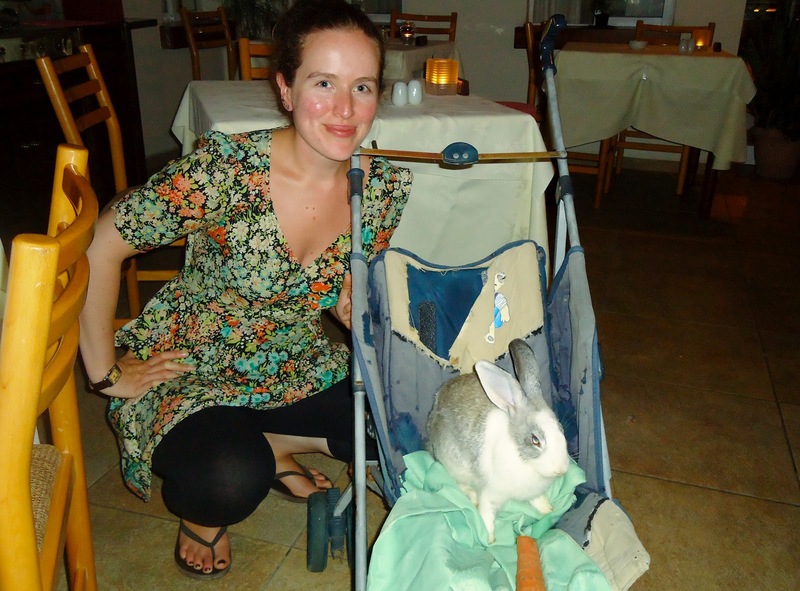 After the spectacle of the Crêpes, we weren’t sure what to expect when a rabbit was wheeled out, perched happily in a pushchair. As we watched him chew on a carrot, and the other table cooed gleefully, I had a flash of panic that this was another cookery demonstration. Were we about to watch someone prepare a rabbit for dinner? Was this the equivalent of picking a lobster? Thankfully, it was just a pet rabbit, Thumper, brought out to get the patrons giddy with excitement. The man was 86, and visits Cyprus twice a year from Britain. Each time he goes to Paphos, he eats at Zaza’s every other night. As the owner sat with us after the meal, we drank a complimentary glass of Filfar, an orange liqueur native to Cyprus. All meals in Paphos end with an aperitif, brandy for the men, Filfar for the ladies. Wherever we ate, we were joined by the owner, or the waiter, or a chef, who would sit with us, sip brandy and tell us about their lives. It appears the taverna’s were not always this quiet. As we settled the bill, we were all given a rose, and a bottle of orange juice squeezed from their own trees. We waddled back to the hotel, laden with gifts, as Thumper sat back in his pushchair and watched us leave. Hopefully he’ll be there to see the day when visitors line the street once more.